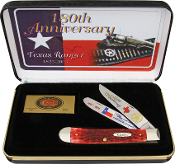 Collectible Texas Ranger Trapper has a closed length of 4 1/8". Stainless clip and spey blades with color artwork of "180th Anniversary" and "They were men who could not be stampeded. 1823-2003". Red jigged bone handles with nickel silver bolsters and inlay shield. Serialized (#889). Black leatherette hardshell gift box with color artwork inside lid. Limited Edition. Certificate of Authenticity. MSRP: $112.95.